In Latin America and the Caribbean there are approximately 50 million indigenous peoples, about 10% of the total population. 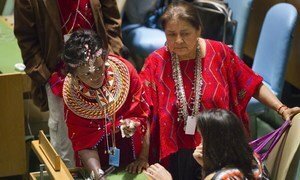 Indigenous peoples in Latin America have undergone an unprecedented mobilization in the past 20 years, but political participation, particularly among women, is still low, the United Nations said in a new report released today. It finds that among Mexico’s 500 lower house representatives, 14 are indigenous and four of them are women (2012-2015). In Guatemala, there are 158 seats in parliament, 19 of which are occupied by indigenous peoples, three of them women (2012-2016). Around 2,300 indigenous participants are expected to discuss culture, education and health during the 12th session of the United Nations Permanent Forum on Indigenous Issues, which will include a special focus on youth, indigenous groups in Africa and the importance of strengthening ties with international financial institutions.